Women in Butte and Anaconda also tried to further the interests of miners by participating in local union efforts, but here they were more likely to be marginalized or excluded. Local 117 of the International Union of Mine, Mill, and Smelter Workers (or Mine Mill) established a women’s auxiliary in 1939. The auxiliary’s goals were to educate women and children about the labor movement and assist the local union during strikes and legislative sessions. While in some communities, strong women’s auxiliaries actively promoted community unionism, in Butte organizations like the Carpenter’s Union Ladies Auxiliary functioned more like middle-class women’s clubs. 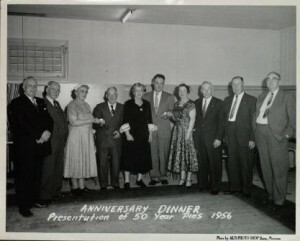 Members here are pictured with their husbands, who are receiving their fifty year pins. Collection LH067, Carpenters Union Ladies Auxiliary Local 222, Butte-Silver Bow Public Archives. Aulette, Judy, and Trudy Mills. “Something Old, Something New: Auxiliary Work in the 1983-1986 Copper Strike.” Feminist Studies 14, no. 2 (Summer 1988), 251-68. 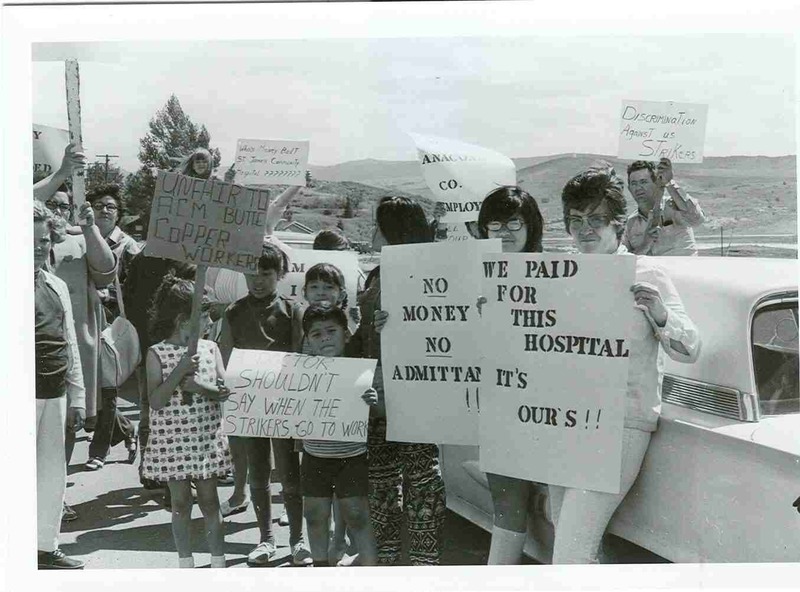 Finn, Janet L. “A Penny for Your Thoughts: Women, Strikes, and Community Survival.” In Motherlode: Legacies of Women’s Lives and Labors in Butte, Montana. Ed. Janet L. Finn and Ellen Crain. Livingston, Mont. : Clark City Press, 2006, 61-75. Mercier, Laurie. Anaconda: Labor, Community, and Culture in Montana’s Smelter City. Urbana: University of Illinois Press, 2001. ________. “Reworking Race, Class, and Gender in the Pacific Northwest.” Frontiers 22, no. 3 (2001), 61-74.